This example shows three-phase harmonic filters in HVDC installations. 2) supply the reactive power consumed by the converter. To illustrate these concepts, a 1000-MW (500 kV, 2kA) HVDC rectifier is simulated. 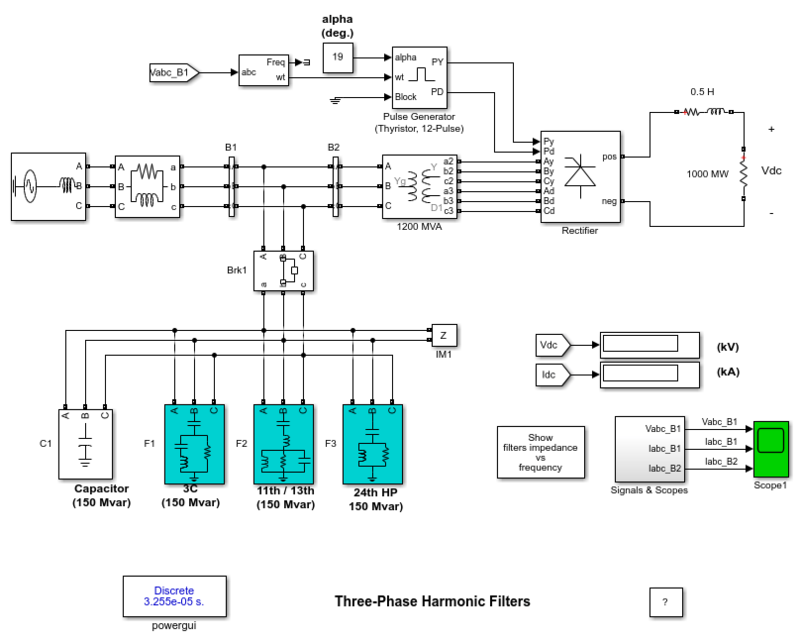 - three filters modeled using the "Three-Phase Harmonic Filter"
The total Mvar rating of the filters set is then 600 Mvar. A three-phase circuit breaker (Brk1) is used to connect the filters set on the AC bus. Run a first simulation with an alpha firing angle of 19 degrees. You should get a DC voltage level of 500 kV. Now, look inside Scope1. Compare the currents flowing into Bus B1 (Iabc_B1, axis 2) with those flowing into Bus B2 (Iabc_B2, axis 3). You can see that the harmonic filters almost eliminate the harmonics generated by the converter. 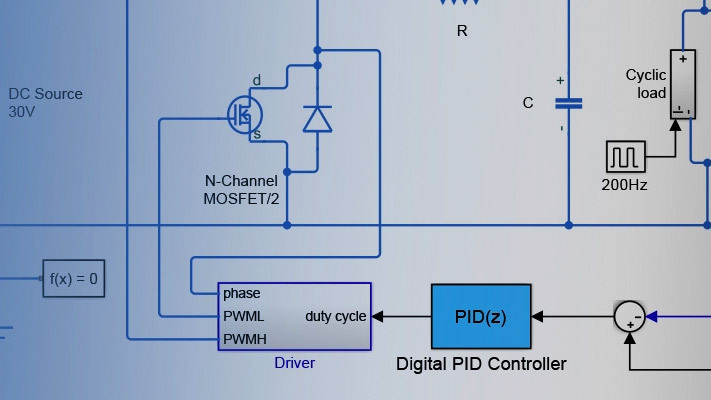 If you use the FFT tool of the powergui, you will find that the harmonic filters reduce the THD of the current injected in the system from 9% to 0.7%. You can also perform other simulations with various values of alpha. Notice the impact on the DC level and on the generated harmonics. 1) Disconnect the filters from the AC bus. To do so, double-click on the breaker Brk1, select 'open' for initial status of breakers and click on the OK button. 2) Open the powergui and select "Impedance vs Frequency Measurement". 3) Click on the Display/Save button. Specialized Power Systems will compute and display the filters frequency response. 4) Double-click on the block "Show filters impedance vs frequency". A second figure, showing the pre-computed filters frequency response will be displayed. The impedance data of the two figures should be identical. 5) If you zoom the figure (using the "Tool" menu), you should find an impedance of 417 ohms capacitive (-90deg.) at 60 Hz. This value confirms that the total reactive power of the filters at 60 Hz is: Qc =V^2/Xc = 500e3^2/417 = 600 Mvar.